Home / Scouting Report / Right said Fred (Biletnikoff)? This year will crown the 25th winner, who will join the esteemed company with the likes of Randy Moss, Larry Fitzgerald, and Megatron. …but as Dynasty owners, how much attention should we be paying to the Biletnikoff? Let’s take a look at the past ten winners and how successful they’ve been in the NFL. Crabtree’s claws/roots provided us reliability and longevity, multiple WR1/2 seasons, slightly hurt this year by the move east and Father Time. Tate is putting together a nice gallery of production – he took a couple of years to get going but has bagged three 1,000 yard seasons out of the past four years. Cooks likes to explore and has been prolific on his travels – 2018 is set to be his fourth 1,000-yard season in a row, across three different cities. Cooper’s barrel of fortunes have been revived following the change of scene (you can probably just ignore 2017 now) and looks set to move back to the elite levels we know him for. 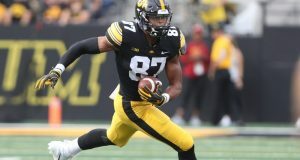 Currently “competing” for targets behind OBJ, Saquon, Engram and a flock of Shepards, Coleman is the one clear miss of the recent Biletnikoff winners. Still only in his third season and in a new home, there is a sliver of hope for CoCo – but presumably, he’s on the waiver wire in your league and I would suggest probably best for everyone if he stays there. Dede and Marqise befell the same fate by joining a franchise that ideally would throw the ball “0%” of the time. Lee’s summer ACL ruled him out for the year, following his contract extension after his “breakout” season… where he almost flirted with the idea of becoming a WR3. This should have been the year Lee fully stepped forward, but instead, 2019 will now decide whether he will become a solid WR2 or be bumped over to the “misses” section. I personally have Marqise as a buy-low candidate; the injury and dire QB situation in Jacksonville should suppress the price even further. Lee should be fine injury-wise for next season and should slot right back in to commanding a sizeable target share, as well as enjoying space to work in as defenses commit to stopping “Rocky” Fournette run. Dede has taken a big step forward in his second year, currently a WR3 and clearly ahead of Keelan Cole & DJ Chark in the depth chart. Westbrook fell in a number of rookie drafts in 2017 going in the fourth or fifth rounds in most cases. Not someone I would overpay for now, but Biletnikoff-believers may have picked up a bargain two years ago. As expected, James Washington’s opportunities in Pittsburgh have been severely limited behind AB and Ju-Ju. Having time to acclimate to pro-football is not a bad thing and if Washington is spending most of his practice reps with college buddy Mason Rudolph then, when the changing of the guard does happen for the Steelers, Washington’s production could sky-rocket quickly. Too early to buy now, but perhaps in a year’s time, Washington owners frustration might open a window. From a Fantasy perspective, definitely a miss. However, hard to pin the blame for this on the Biletnikoff selection committee. Blackmon led all Rookie receivers in his debut season and was averaging over 100 receiving yards per game prior to his suspension in 2013. In summary, only one miss in ten. 90% sounds like an “A” to me. 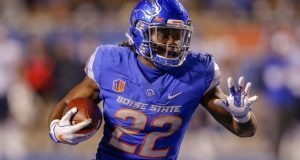 The 2019 Biletnikoff winner will be announced on 6th December, with the recipient likely entering either the 2019 or 2020 NFL drafts. 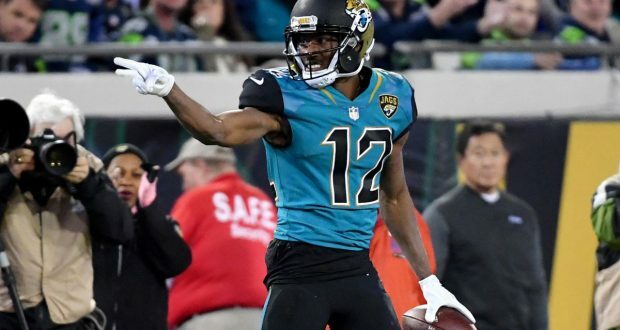 Chances are the winner will be relatively high on your draft board anyway but, if like Dede Westbrook they start to slip down, history suggests you should feel confident in taking a punt on them! Previous: Ep. 247 – The Playoffs Are Upon Us, Now What?